November 2011 had its ups and downs, but it was a mild month overall at 4.4 degrees above average. The reason we were mild is that the jet stream mainly lined-up from west to east across the northern tier states, or from southwest to northeast from New Mexico into the Great Lakes(typical of a La Nina pattern). Things could change as we head into December. Although the first few days will be near or slightly above average, colder air will start invading the Midwest as soon as next week. This is partially because the North Atlantic Oscillation (NAO) is expected to go from positive to near-neutral, or even negative later in the month. A more negative NAO tends to send the polar jet stream further south on the North American continent. If you thought the month of November was lacking in sunshine you would be correct. Climatologically we don't see a lot of sun during November and December and this year was no exception. There were only five sunny days (well maybe six after today), 13 partly cloudy days and 11 cloudy days. While we've got plenty of sunshine out for the remainder of the afternoon look for the clouds to roll back in just in time for the upcoming weekend. Skies Tuesday evening cleared out just in time to allow temperatures to fall into the upper teens and low 20s this morning. With what little wind we did have from the northwest caused wind chill values to fall into the lower to mid teens areawide. We'll continue with sunshine today and highs rising back into the low 40s. It's a good thing 'our sun' behind the storm center isn't much of a breakfast fan! On this date back in 1976, Rockford recorded a low temperature of -6 degrees. The coldest ever for November 29th. The high temperature for the date was only 11 degrees, which was a record low-maximum. Taking the high and low together, this date was 29 degrees below average! In fact, the entire month of November 1976 was an unusually cold one. The average temperature was 28 degrees for the month, making it the coldest November on record in Rockford at an impressive 9.2 degrees below average! This cold fall was just a taste of what lie ahead for the coming Stateline winter. A blocking high over the Arctic forced the Polar low further south than normal that winter, forcing cold air into the Midwestern US. Temperatures across the Stateline in the winter of 1976-77 rain about 8 degrees below average, making it the 3rd coldest winter on record. Winds continue to howl from the north late this morning. Sustained winds around 25mph combined with wind gusts nearing 35-40 mph have kept wind chills through the morning in the mid 20s. Unfortunately, the wind will remain rather strong going into the afternoon but begin to relax some into the evening. Wind chills will remain in the mid 20s through the afternoon before dropping into possibly the low teens by early Wednesday morning. Winds tonight likely won't go calm and with temperatures expected to fall into the lower 20s by daybreak tomorrow the slightest wind will really put a chill in the air! Make sure you're dressed in layers today and early tomorrow! As Chief Meteorologist Ty Shesky touched upon Monday evening, our first accumulating snow may not be that far off. The first snow chance will be along a cold front moving in from the northwest late Thursday. But because it's lacking any significant moisture we're only expecting a few flurries from it. It will, however, pull down enough cold air to keep temperatures in the 30s going into the weekend. The latest evening run of the GFS weather computer model develops an area of low pressure in east Texas Saturday and lifts it up through southern Illinois and into Indiana by Sunday morning. At the same time a stronger cold front will move in reinforcing the cold air already in place. With temperatures below freezing, this one particular model is producing shoveling snow by Sunday morning. Now before you get too excited, I must stress that this is only one of many weather models I look at in the morning. And at this point this is the only one that is tracking the low to our east. The rest are actually moving the low further west which would produce more of a rain/snow mix. This time of year our weather models have a tough time resolving big changing patterns, so as the weekend nears we'll have a better handle of which storm track this low will take. Although it looks like a pretty active week of weather for much of the Stateline with flurries possible late Thursday or early Friday, significant snow will probably avoid the area until the weekend. An arctic front will drop in from Canada sometime Saturday night or Sunday morning. Along this front, we could see some accumulating snows across the Stateline. If an inch or more of snow were to accumulate on Sunday, this would be "right on cue". Sunday is December 4th. Rockford's long-term average first snow of 1" or more occurs on exactly this date! Low pressure in the deep south will gather strength and eventually become cut-off from the main flow in the jetstream later this afternoon. Already heavy rainfall has plagued parts of Kentucky with more expected today and tonight. Flood warnings and watches have been issued for southern Indiana, Kentucky and Tennessee. The low will lift north into Ohio by Tuesday afternoon continuing to pull gulf moisture with it. Cold air wrapping around the low along with very cold air above will produce accumulating snow through northern Mississippi and western portions of Tennessee and Kentucky. In fact, accumulations over three inches will be possible for some. Winter Weather Advisories and Winter Storm Watches have already been issued. They'll see their first accumulating snow before Chicago will! We had a very light accumulation earlier this month! The Sunday after Thanksgiving is traditionally one of the busiest travel days of the year. If you are heading anywhere across the lower-48, major travel problems should be few and far between. Here in the Stateline area, lingering flurries are possible early in the morning behind a departing cold front. A little further to the east in Milwaukee and Chicago, the precipitation could hang-on as late as 2pm as a light mix of rain and snow. This will cause some minor delays at the major airports. If your travels take you to Cleveland, Pittsburgh, or Atlanta, the same cold front that bought us a wet Saturday will bring wet weather and minor delays to these airports. Likewise the Pacific Northwest is expecting rain due to an area of low pressure coming in off the ocean. But for most of the country, the weather looks pretty tranquil for this time of year. Dry weather will dominate from here westward to California and southward to the Gulf coast. An area of low pressure will move through Wisconsin during the afternoon on Saturday dragging a cold front with it. Early in the day Saturday southerly winds will keep the precipitation as rain but once the front passes by mid-afternoon colder air will get wrapped in behind the front. This will also happen around the time a trough (or dip) in the jetstream is expected to strengthen. Assuming the cold air comes in and cools the column of air quick enough Saturday night, there may be some light accumulations by Sunday morning. The image is the raw data output for Sunday and shows anywhere between a half an inch to a little over an inch of snow remain possible early in the day. Partly cloudy skies will be found early today but the clouds will increase throughout the afternoon and pretty much last through the weekend. A cold front currently in the Plains will move east today and tonight. As it does rain will begin after midnight and continue through Saturday afternoon adding up to about a half an inch or so. Once the front passes mid-afternoon Saturday northwest winds will pull down cooler air allowing snow flurries to mix with the rain Saturday night. Wrap around moisture will keep light snow showers going Sunday with possible minor accumulations through the afternoon. The gusty winds will stay through the weekend as temperatures fall into the upper 30s by Sunday. It looks like a possible pattern change heading into the first week of December will allow colder air from the north to spill south keeping temperatures below average, in the upper 30s for the first weekend of December. 8:25am Update: The fog this morning is becoming a little more dense so please be careful if traveling. Expect the fog to last through at least mid-morning if not through the noon hour. We've had some fog to deal with the past couple of mornings and we'll likely see fog redevelop late tonight/early Friday morning. The image on the left is a forecast sounding (snapshot of the different layers of the atmosphere) from Davenport, IA Wednesday evening. The red line indicates the temperature profile while the green line is dew point. What I want you to notice is how the temperature (red line) increases with height above the surface. This is called an 'inversion' and means that the temperatures above are warmer than what they are at the surface. Also notice how the temperature and dew point line are close together below the inversion and then move further apart higher in the atmosphere. With the lines close to each other like that, it's a pretty good indication there is moisture 'trapped' in the lower levels of the atmosphere and that's why we've got the fog this morning. Unfortunately, the inversion is a pretty strong one and looks to stay with us through early afternoon. This may cause the clouds to be slow to leave today which could keep temperatures down into the lower 50s. Gusty southwest winds may allow a little bit of the drier air above to mix down to the surface which will help skies become at least partly cloudy. The cloud cover and fog will probably return tonight but we should see more sunshine Friday afternoon. Fog is already showing-up across much of the Stateline as of 9pm tonight: Rochelle, Freeport, Savanna, and DeKalb are all reporting fog. So far Rockford is just reporting "partly cloudy" skies, but with a temperature of 35 and a dewpoint of 32 I expect fog to form within the next couple of hours over the Forest City. As we said last night, travel with caution tonight and early tomorrow morning by slowing down and using your low beam headlights. The fog should burn-off pretty quickly tomorrow morning as a south to southwest wind along with sunny skies act to "mix-out" any remaining fog before 9am. Clear skies and left-over moisture from showers Tuesday has lead to patchy, dense fog early this morning. Visibility has dropped to less than a mile in a few locations as of 7am this morning and as temperatures have fallen below freezing, there are a couple observations of freezing fog. This may cause a few roadways to be a little slick this morning. Use caution when driving this morning and make sure you use your low beams. With light to moderate rain across the Stateline earlier today and temperatures already close to the dewpoint, expect areas of dense fog to develop after about 1am. The fog will be especially dense in low-lying areas, and in areas that received the most rainfall (generally southeast of Rockford). Fog is already being reported in central and eastern Iowa in places like Waterloo and Mason City. As clear skies gradually work into the Stateline, the air will quickly become saturated and fog will develop. Be sure to travel with your low-beam headlights, allow extra space between you and the driver ahead of you, and reduce your speed for safety. This past Sunday my family and I went up to Rock City for our 'Reuber Family' Thanksgiving and it was there my uncle said he had seen an eagle just east of Pearl City along Pearl City Road. There have actually been several people who have spotted eagles around the area so I thought I would post their photos! It was one year ago today that an EF2 tornado touched down in far eastern Winnebago county and moved through the town of Caledonia. Non-severe thunderstorms rolled through during the morning on November 22nd, 2010 as a warm front was lifting north into northern Illinois. The storms cleared mid-morning and sunshine was found for the rest of the morning and into the early afternoon. With the increasing sunshine the instability also rose ahead of a strong cold front and area of low pressure. Afternoon temperatures rose rapidly into the upper 60s with a record high of 69° being recorded in Rockford. This broke the old record of 67° set back in 1913. Storms redeveloped in eastern Iowa ahead of the cold front and quickly moved east over the Mississippi River. It was around this time that a Tornado Watch was issued for northern Illinois and southern Wisconsin. About an hour later Severe Thunderstorm Warnings were issued for several counties across north-central Illinois. Shortly before 3pm one storm over the town of Winnebago started to show signs of rotation. This storm then moved northeast over Rockford and Loves Park when tornado warnings were issued and a tornado touched down just west of Harvey Road. 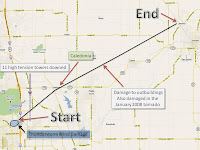 It was around 3:10pm when the EF2 tornado moved through Caledonia producing significant damage throughout the town. The tornado continued northeast near Capron before eventually moving into McHenry County. It was the unusual warmth that afternoon that helped fuel those storms. And typically during a La Nina pattern there is an increased risk of 'cool-season' severe weather outbreaks. The same happened back in January 2008 when a tornado moved through Poplar Grove. This is something to keep in mind as La Nina has returned and will stick around through this upcoming winter. The First Warn Weather Team was here with on-air and online coverage before, during and even after the storm moved through. We brought you pictures and video as the storm moved through and that's why you can depend on the First Warn Weather Team when severe weather threatens. FAIRBANKS, Alaska - Alaska’s second-largest city is used to cold weather, but few residents expected record-breaking cold this early in the season. Shawn Ross has lived in Fairbanks his entire life and says few people were prepared for this severe of a cold snap in mid-November. The Fairbanks Daily News-Miner reports that for the second time in three days, Fairbanks set a new low temperature record on Thursday. A temperature of 41 degrees below zero - the first 40 below temperature of the season - was recorded at Fairbanks International Airport at 6:29 a.m. The National Weather Service in Fairbanks says that broke the old record of 39 below set in 1969. The last time Fairbanks residents saw 40-below temperatures in November was in 1994. Fairbanks set a new record of 35 below on Tuesday and the temperature bottomed out at 39 below on Wednesday, two degrees shy of the record. Thursday’s record low of 41 below marked the sixth earliest 40-below temperature recorded by the National Weather Service in Fairbanks since 1904. The earliest it’s ever hit 40 below in Fairbanks was Nov. 5, 1907, when it hit 41 below. The last time Fairbanksans saw 40-below temperatures in November was in 1994, when temperatures of 45, 43 and 45 below were recorded on Nov. 24, 25 and 30, respectively. The bitter, early season cold had Interior residents wondering if somebody turned the calendar ahead a month or two. Even though a few scattered showers will be found Tuesday afternoon, high pressure building in the southeast will shift our winds to the southwest late Wednesday and into Thursday which will help bump highs Thursday and Friday afternoon into the middle and possibly upper 50s! Winds will be gusty, especially late Thursday into Friday, as a cold front begins to move in from the northwest late Friday afternoon. It's this front that will cause the weekend to become a little messy with showers, and maybe a thunderstorm, late Friday into Saturday. The development and track of the next low pressure system will play a big factor into just what the end of the weekend will look like. The image on the left is the latest run of the GFS weather model and this particular model develops a low along the cold front and rapidly lifts it northeast into Indiana by Sunday afternoon. It also has enough cold air wrapping in behind to possibly create a few snow showers during the day. Remember that this is only one of several weather models we look at and at this point all of them are pointing to different scenarios for this upcoming weekend. As the time nears we'll be able to hammer out the details but for now just focus on the nice weather expected for Thanksgiving! Thanksgiving Day is Looking Great! Skies will be mostly cloudy overnight, winds will be northeast to east at 6-12 mph, and the temperature will drop to the upper 20's. It will start off mostly cloudy on Monday, but become partly cloudy to the north and west of Rockford in the afternoon. The high temperature will be near 47 degrees with a breeze from the east at 6 to 12 mph. It will start off partly cloudy on Monday night, but clouds will increase after midnight. The overnight low will be in the middle 30's. A front lies nearly stationary from the Ohio River southwest across Arkansas into central Texas. High pressure is centered over the Upper Peninsula of Michigan, and it will move to Quebec in southeastern Canada by morning. The high will lay a ridge back across the upper mid west through Tuesday. That synoptic setup will keep winds coming in from the east to northeast for the next couple of days as a new area of low pressure develops on the stationary front over northeast Texas by Monday evening. By Tuesday morning the low will be located over Missouri. It will move across southern Illinois during the day, and reach western Ohio by Tuesday evening. The track of the low will throw enough moisture northward to keep the skies cloudy on Tuesday, and cause some light rain showers. High pressure over the southern plains will ridge into the mid west on Wednesday. It will be sunny on Wednesday, and with a light northwesterly wind, the temperature will reach the upper 40's. All in all it will be a great day for travel in the mid west on the day before Thanksgiving. The high will move to eastern Kentucky by early Thursday morning. It will be another sunny day on Thanksgiving Day, and a brisk southwesterly wind will develop by afternoon. Temperatures will soar to 56 degrees, and perhaps even higher. Compare that temperature to the average high for November 24th of 43 degrees. It will be the warmest day on Thanksgiving since 2006. Enjoy! Winds will continue to be vigorous through Thursday night and Friday. Friday will be another very mild day with a high in the middle to upper 50's. A weather system will be approaching the Stateline from the plains states. Gulf moisture will be drawn northward into the system so there will be a slight chance of showers under partly cloudy skies. Rain showers will be likely on Friday night, and some showers may linger into Saturday. It will be mostly cloudy and cooler on Sunday with a high in the low 40's. A cold front will move from west to east across the Stateline overnight. Some scattered sprinkles are still possible, but most of the activity has moved off to the east. Winds will shift from southerly to northwesterly around midnight with the passage of the front. The low tonight will be around 34 degrees near daybreak. The clouds will be slow to depart on Sunday, so with mostly cloudy skies, and a northeasterly wind, it will be a little cool with an afternoon high only around 43 degrees. Clouds will continue to be stubborn through Tuesday, so mostly cloudy skies will prevail. A couple of disturbances will pass by to our south, but probably will not be close enough to cause any precipitation. Temperatures will be a little above seasonal averages with highs in the mid to upper 40's, and lows in the low to middle 30's. The good news is that is will be a dry week. 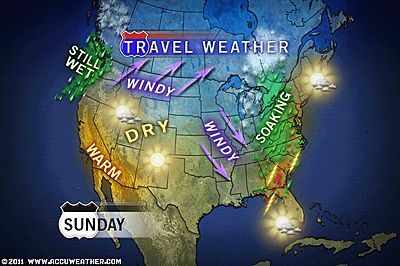 The travel day on Wednesday before Thanksgiving will be sunny with a high around 47 degrees. A big warm up will take place on Thanksgiving Day with mostly sunny skies, a high in the upper 50's, with a stiff southwesterly breeze. The very mild weather dry weather will continue on black Friday, so there will be good Christmas shopping weather, but hold on to your hats. It will be mostly sunny, windy, and very mild temperatures around 60 degrees by mid afternoon. The next cold front will approach from the west on Friday night, and there will be a chance of showers. It will turn cooler on Saturday with a good chance of showers. A Wind Advisory has been issued for Winnebago, Boone, McHenry, Ogle, Lee and DeKalb counties through 6pm this evening. Winds will remain gusty throughout the afternoon as southerly gusts could near 40-45mph. These gusty winds could cause loose objects to fly around and will likely make travel for higher profile vehicles difficult. Also, the increased wind along with very low humidity this afternoon will increase the fire danger through the remainder of the day. Thanksgiving Day: Warm in the kitchen and warm outside? It's hard to believe that Thanksgiving is right around the corner and temperatures for your turkey day may not be all that terrible. After an area of low pressure passes this weekend another one will move to our south through the middle Mississippi River Valley and into Ohio by Wednesday. A brief cool down will be found, however, high pressure looks to build once again with southwesterly winds in place late Thursday. This could very well allow temperatures to rise into the lower and middle 50s for Thanksgiving Day. In fact, it looks like temperatures may range above average through the end of November. Tomorrow and Saturday morning, the Leonid Meteor Shower will be at its peak. The shower can be found near the constellation Leo (south of the Big Dipper) with up to 20 meteors per hour. However, the total may be restricted to less than a dozen per hour this year because of a bright half moon. The Leonids are visible right now because the Earth is passing through debris from the comet 55P/Tempel/Tuttle. The pieces of debris are often as small as grains of sand, but when they burn-up in the earth's atmosphere they can briefly leave bright streaks in the sky. For the best viewing, get away from the city lights if possible! Storms started before the sun rose Wednesday morning and continued to push east as a cold front sweep across the south and into the southeast. 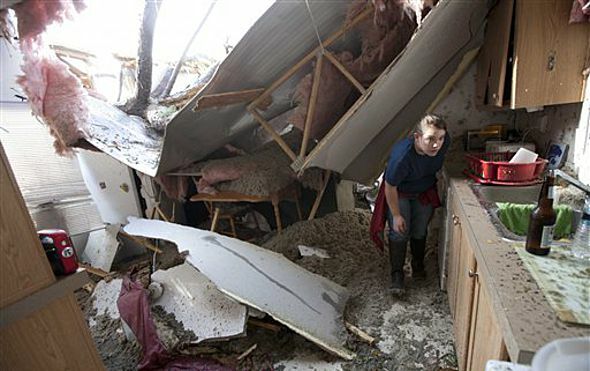 A preliminary 16 tornadoes were reported yesterday killing at least 5 and injury many more. Typically when we think of 'severe weather season' the spring time comes to mind, not November. But, did you know that there is actually a second spike in severe weather towards the end of October and during the month of November? That's right! The southern states typically see a 'bump' in severe weather during this time...just like what was experienced Wednesday. The jetstream tends to get a little stronger during the late fall as it shifts further south pulling down colder air from the north. This causes strong fronts and upper air systems to move across the U.S. and when you have the contrast between the warm, moist air to the south and the cold, dry air moving in from the north that's usually when you see the strongest of the storms. When looking at the year as a whole you will see a greater number of severe weather outbreaks during the spring than in the fall. The days are longer in the spring and summer and there is more time for daytime heating (creating instability) to occur. In the fall, the days grow shorter cutting off the max afternoon heating. Second, warmer air aloft is typically found in the fall because the months leading up to October and November have warmed the atmosphere In the spring we're coming out of winter and that's when you usually find the cold air several thousand feet above. And you need that cold air above to get storms to rapidly develop. Warmer air above usually limits thunderstorm potential. It will be interesting to see how things play out going into the winter season with a strengthened La Nina once again. Severe weather broke-out across the southeastern US today ahead of a slow-moving cold front... This front was accompanied by favorable energy in the jet stream and plenty of moisture. At least 16 tornadoes, 9 reports of hail, and 69 reports of high winds were relayed to the Storm Prediction Center as a result of the outbreak that stretched from North Carolina back to Alabama. 3 people were killed near Rock Hill, SC, and one person was injured in a tornado at Whitfield, AL. Here's more from accuweather.com. October was the 8th warmest on record. Do you feel Global Warming is to blame? According to NOAA, global temperatures were the 8th warmest on record for October and strengthened La Nina conditions are expected through winter. Do you believe this increase in warming is due to global warming? The globe experienced its eighth warmest October since record keeping began in 1880. Arctic sea ice extent was the second smallest extent on record for October at 23.5 percent below average. 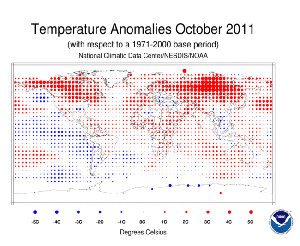 Additionally, La Niña conditions strengthened during October 2011. According to NOAA’s Climate Prediction Center, La Niña is expected to continue through the Northern Hemisphere winter. This monthly analysis from NOAA’s National Climatic Data Center is part of the suite of climate services NOAA provides government, business and community leaders so they can make informed decisions. The combined global land and ocean average surface temperature for October 2011 was the eighth warmest on record at 58.14 F (14.58 C), which is 1.04 F (0.58 C) above the 20th century average of 57.1 F (14.0 C). The margin of error associated with this temperature is +/- 0.13 F (0.07 C). The global land surface temperature was 1.98 F (1.10 C) above the 20th century average of 48.7 F (9.3 C), making this the 2nd warmest October on record. The margin of error is +/- 0.20 F (0.11 C). Warmer-than-average conditions occurred across Alaska, Canada, most of Europe and Russia, and Mongolia. Cooler-than-average regions included the southeastern United States, most of southern and western South America, parts of Algeria and Libya, part of Eastern Europe, and far southeast Asia. The global ocean surface temperature was 0.70 F (0.39 C) above the 20th century average of 60.6 F (15.9 C), making it the 11th warmest October on record. The margin of error is +/- 0.07 F (0.04 C). The warmth was most pronounced across the north central and northwest Pacific, the northeast Atlantic, and portions of the mid-latitude Southern oceans. The United Kingdom marked its warmest October since 2006 and eighth warmest in the last 100 years, at 3.6 F (2.0 C) above the 1971–2000 average. Several locations in Argentina experienced their coolest October in five decades. The combined global land and ocean average surface temperature for the January – October period was 0.95 F (0.53 C) above the 20th century average of 57.4 F (14.0 C), making it the 10th warmest such period on record. The margin of error is +/- 0.16 F (0.09 C). The January – October worldwide land surface temperature was 1.53 F (0.85 C) above the 20th century average, the sixth warmest such period on record. The margin of error is +/- 0.34 F (0.19 C). The global ocean surface temperature for the year to date was 0.74 F (0.41 C) above the 20th century average and was the 12th warmest such period on record. The margin of error is +/-0.07 F (0.04 C). La Niña conditions strengthened during October 2011. According to NOAA’s Climate Prediction Center, La Niña is expected to continue through the Northern Hemisphere winter 2011/2012. Monthly rainfall across Spain was 35 percent below average, the driest October since 1998. The average Arctic sea ice extent during October was 23.5 percent below average, ranking as the second smallest October extent since satellite records began in 1979. The extent was 846,000 square miles (2.19 million square kilometers) below average and 127,000 square miles (330,000 square kilometers) larger than the record low October extent set in 2007. On the opposite pole, the October Antarctic monthly average ice extent was 1.2 percent above the 1979–2000 average, the 12th largest on record. Despite a record-breaking snowstorm in the US Northeast, Northern Hemisphere snow cover extent during October was below average, and ranked as the 15th smallest October snow cover extent in the 44-year period of record. The North America and Eurasian land areas both had below-average snow cover during the month. Scientists, researchers and leaders in government and industry use NOAA’s monthly reports to help track trends and other changes in the world's climate. This climate service has a wide range of practical uses, from helping farmers know what and when to plant, to guiding resource managers with critical decisions about water, energy and other vital assets. Severe storms are moving across Alabama this morning as a cold front stretches through the deep south. A Tornado Watch continues for Alabama southwest into the southern tip of Louisiana through the 10am, although it may be extended especially for Alabama. Several tornadoes warning have been issued for the line of storms moving through Alabama. This line will continue to move east through the morning and early afternoon. Quiet, but cold! That's what you can expect around here for the next couple of days. As high pressure slides south of the Great Lakes Thursday night southerly winds will pull a warmer air mass into the area this weekend. This will also be ahead of a developing area of low pressure that will move out of the Rockies and track northwest of the immediate area. For most of Saturday we'll remain in the warm sector of the system as southwest winds at the surface and above warm temperatures back into the upper 50s and possibly low 60s. Further north across the upper Midwest snow possibly accumulating 4"-8" will be found. One thing we'll watch heading into this weekend will be the timing of a cold front that is forecast to move through either during the evening hours Saturday or into the overnight. If the front were to move through earlier in the day we would stand a better chance of having a few storms accompany the showers. A later frontal passage would yield less instability for any storm development. It's a couple days away but it's something we'll continue to monitor in the First Warn Weather Center. 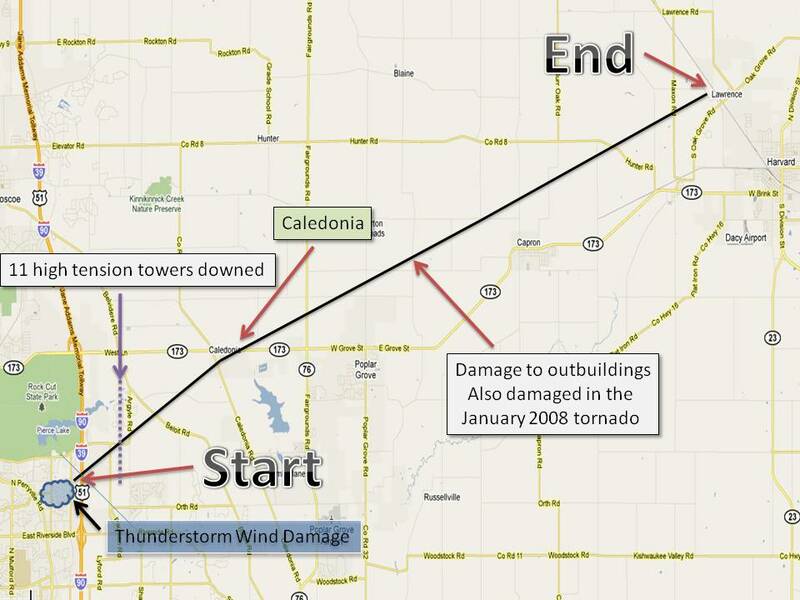 After all, next Tuesday will be the one year anniversary of the Caledonia tornado. From the 60s Sunday and Tuesday to the 40s today, temperatures have been on an up and down swing and it looks like that will continue into the weekend. Canadian high pressure will move to the west of the Stateline today and tomorrow and despite the sunshine a channel of cold, dry air will move into the area this afternoon. This cold air could lead to one of the coldest nights so far this season tonight as lows fall into the middle 20s. But just as quickly as temperatures will fall they'll rise again heading into the weekend. Nyamuragira Volcano in East Africa began erupting earlier this month in what could be the Congo's biggest volcanic eruption in a century. 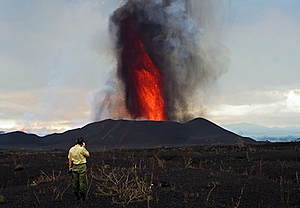 The volcano erupts once every two years, but volcanologists say this is the most active they've ever seen Nyamuragira. It is spurting lava up to a thousand feet in the air, but poses no immediate threat to Virunga National Park. In fact, park officials say the volcano could actually spark an increase in tourism. Nyamuragira is located in eastern Congo, north of Goma. Here is a list of storm reports from NWS Lincoln, IL. This includes a tornado near the town of Mahomet. REPORT OF FUNNEL CLOUD ALSO CONFIRMED BY A SPOTTER. ROOF BLOWN OFF AN OUTBUILDING. TIME ESTIMATED. NICKEL TO QUARTER SIZE HAIL REPORTED. STRETCH OF LINES DOWN. TIME ESTIMATED. RAIN FELL IN 15 MINUTES. SWOP REPORT. AT 137 PM CST...NATIONAL WEATHER SERVICE DOPPLER RADAR INDICATED A SEVERE THUNDERSTORM CAPABLE OF PRODUCING A TORNADO. THIS DANGEROUS STORM WAS LOCATED NEAR POTOMAC...OR 15 MILES NORTHWEST OF DANVILLE... MOVING EAST AT 50 MPH. LOCATIONS IMPACTED INCLUDE... ROSSVILLE...HENNING...ALVIN AND BISMARCK. TAKE COVER NOW. MOVE TO AN INTERIOR ROOM ON THE LOWEST FLOOR OF A STURDY BUILDING. AVOID WINDOWS. IF IN A MOBILE HOME...A VEHICLE OR OUTDOORS...MOVE TO THE CLOSEST SUBSTANTIAL SHELTER AND PROTECT YOURSELF FROM FLYING DEBRIS. This week is Winter Weather Preparedness Week: How prepared are you? This week is Winter Weather Preparedness week in Illinois and now is the time to start thinking of what you need to keep with you in your vehicle or what projects need to be done around the house for this upcoming winter season. Even though it occurred nine months ago I'm sure the February blizzard is still fresh on the minds of everyone. A major winter storm stranded people across northern Illinois and southern Wisconsin, schools and businesses were closed and there were even reported power outages. With another La Nina winter expected for us, it's important that you're prepared for whatever Mother Nature may throw at you. Make sure you have plenty of non-perishable food, drinking water, a battery powered weather radio and a portable AM/FM radio, flashlights, medication and a first-aid kit in your home. Also create a winter kit for you vehicle should you ever get stranded during a winter storm. Many of the items you would need for you home you will want to put in your vehicle's kit along with extra clothing, blanket, tow rope, jumper cables, shovel and sand or cat litter (in case you get stuck). We are already in late autumn and winter is just right around the corner. Now is the time, if you haven't done so already, to make sure your furnace and fireplace are inspected and properly maintained and be sure to change or clean your furnace filters. Shoveling snow can be hard work; especially heavy, wet snow. Know your limits when shoveling and be sure to rest frequently and pace yourself. Use a proper snow shovel and be sure to lift with your legs and not your back. Go inside immediately if you experience any chest or arm pain. If you must travel during dangerous weather make sure someone knows your route and make sure you tell family and friends of your travel plans, when you're leaving and when you're expected to arrive at your destination. Keep your gas tank full and make sure you have a winter kit in your vehicle. If you were to lose power during a winter storm, place any type of space heater at least three feet away from walls, furniture and other combustible items. Never light a grill or wood burner to heat your home. If you use a portable generator make sure that is is properly ventilated outdoors to avoid carbon monoxide poisoning. Also, make sure you have a properly working carbon monoxide detector and smoke detector in your home. An area of low pressure just northwest of St. Louis, MO has a warm front extending south of Springfield, IL to northwest Indiana. North of the front temperatures remain in the 30s/40s while south of the front temperatures are in the 60s and 70s. Dew points remain fairly low across northern Illinois but showers have increased some in coverage this morning and will continue to do so as the low moves through central Illinois. Elevated thunderstorms have quickly developed from Peoria to Pontiac Illinois and will continue to lift northeast. I wouldn't be suprised if our southern counties were to experience a thunderstorm or two as the front lifts northward. Any severe weather should remain to our south. Gusty west/southwest winds Sunday afternoon pushed highs into the middle and upper 60s! And would you believe it Chicago-O'hare reached 70°. The warmer weather did come with a price, however. Peak wind gusts across the area were clocked over 40mph with sustained winds getting close to 30mph. One of our weather watchers in Kingston (DeKalb Co.) had a wind gust of 52 mph. Gusts that high were also recorded closer to Chicago. While winds will be breezy at times today they'll be no where near the strength they were Sunday. The Midland WR-120 desktop NOAA weather radio knows it is supposed to receive a weekly test from the National Weather Service every seven days. If the radio goes for ten days without receiving a test, it gives out one beep every ten minutes. This week’s national test of the Emergency Alert System (EAS) required National Weather Service offices to cancel their weekly NOAA Weather Radio tests. Midland WR-120 radios, having not received a weekly test in the past ten days, are now beeping once every ten minutes. To cancel the beeping, unplug the radio from the wall, turn the radio over, and remove one battery. Replace the battery and plug the radio back in. The settings on the radio will NOT be affected by this, as the SAME county code, and all other information is stored on a flash memory chip. 1) Push MENU. “SET TIME” appears. 3) Use the up/down arrows to adjust the hour up or down. To get from AM to PM, just continue past the hour 12. 5) Use the up/down arrows to adjust the minutes up or down. Right arrow to access both of the minute digits. 6) When you have set the clock to the proper time, hit MENU twice. The radio will display “SAVING”. You are done setting the clock. We apologize for the inconvenience. The ten-day missed test alarm is a way to assure viewers that their weather radio is performing properly. NOTE: The previous version of this radio, the Midland WR-100 does not make an audible beep. However, it will display the words “CHECK RECEPTION” until it is re-set using the same steps as outlined above. A cool front is moved across the area early this evening, and will continue it's movement south and east tonight. Skies have become mostly clear, but high clouds will move in from the southwest after midnight. It will be cooler overnight with a low in the upper 30's. Low pressure on the front over Kansas will move to Missouri by daybreak, and across central Illinois by noon Monday. It could cause some sprinkles or light rain showers on Monday morning. It will be a little cooler than Sunday, but still mild with a high in the upper 50's with mostly sunny skies in the afternoon. It will be mostly clear overnight on Monday night with a low in the middle 30's. A very strong cold front will approach northern Illinois from the northwest on Tuesday. It will not have any appreciable moisture to work with so no rainfall is anticipated with the front. Temperatures are expected to reach the low 50's before the front arrives, and then fall off during the afternoon... plunging to near 27 degrees on Tuesday night, and struggling to reach near 40 degrees on Wednesday. Wednesday night will be the coldest night so far this fall season with a low around 23 degrees under clear skies. It will be mostly sunny on Thursday, but still chilly with an afternoon high near 40 degrees. By Friday the massive cold high pressure area will be to our east over Virginia, and the winds will shift to the southwest bringing warmer temperatures back across the Stateline. It will be mostly sunny with a brisk southwest wind on Friday pushing afternoon temperatures back up around 50 degrees. The warm up will continue through the weekend as a new cold front approaches from the northwest. The Gulf of Mexico is expected to open up so showers will be possible on Friday night, scattered across the area on Saturday, and even some thunderstorms are possible on Sunday. As of this time the front is expected to stall out just to our northwest on Saturday night, and hold there as a storm system develops over Colorado. That would allow temperatures to approach 60 degrees on Sunday. Longer range forecasts from the National Weather Service are indicating above normal to well above normal temperatures for much of Thanksgiving week. One must keep in mind that is pretty far out to have an accurate forecast this time of year considering an area of massive arctic high pressure will be building southeast across Canada by Sunday. Will it have the strength to push that front across the Stateline Thanksgiving week? It is too early to answer that question. A weather system moving along the Canadian border just north of North Dakota is strong enough to cause brisk southerly winds across the midwest tonight. Temperatures will not be a chilly as recent nights holding nearly steady in the upper 40's to low 50's under mostly cloudy skies. It will be windy on Sunday with southwesterly winds 20 to 30 mph with gusts to 35 mph. The south and eastern parts of the Stateline including Lee and Dekalb counties have a WIND ADVISORY in effect starting at 8 am on Sunday and lasting until 6 pm for southerly winds 25-35 mph with gusts as high as 50 mph. It will be mostly cloudy with scattered light rain showers possible in the morning. It will become partly cloudy and colder on Sunday night with the temperature dropping back into the upper 30's along with diminishing southwesterly winds. The fast moving active weather pattern will sweep another front into the area on Monday, and there could be some scattered light rain showers. A more significant system will move across southern Illinois causing heavier rainfall downstate. A much stronger cold front will push across the midwest by Tuesday afternoon. Skies will clear and temperatures will drop below freezing on Tuesday night. Strong cooling will take place on Wednesday with mostly sunny skies the temperature will be capped in the high 30's in the afternoon. First Snowfall: How do we compare this year? An area of low pressure moved through the Great Lakes Wednesday bringing rain to most of us early in the day but then switching the liquid stuff to the frozen kind as cold air moved in. It was the first snowfall of the season and for some it actually accumulated to an inch or so. We even had a few snow showers Thursday afternoon with a disturbance that came down the western Great Lakes. So how does this compare to our 'average' first snowfall. For Rockford, our average date of seeing a trace or more (less than 0.1") is November 2nd. So from this stand point we weren't too far off. The earliest a trace of snow has fallen was back on October 3rd, 1951 and the latest was December 19th, 1999. December 1st is the average date of recording an inch or more of snow; the earliest occurred twice and ironically on the same day - October 23rd 1917 and 1929! The latest date was back in 1921 on February 7th. Last year a trace of snow fell on November 4th and on December 4th was when we received over five inches of snowfall. A warm front lifting through the area this morning will keep the clouds around through the early afternoon. Temperatures today will reach the middle and upper 40s. Quiet, but breezy, weather can be expected Saturday as low pressure organizes in the northern Plains and pulls a cold front through Sunday afternoon. A shortwave moving into British Columbia and a cut-off low off the southern coast of California this morning will 'merge' together late Saturday causing very strong winds within the jetstream to push an area of low pressure through the upper Great Lakes. Winds will really begin to pick up late Saturday ahead of a cold front that will move through Sunday. Scattered showers are likely throughout the afternoon before the front settles to the south Monday. High pressure will then move in at the surface keeping a northerly flow across the Midwest and temperatures right at or slightly below average into the middle of next week. 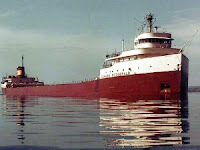 It's hard for me to believe that it's been 36 years since the Edmund Fitzgerald sank in Lake Superior, just 17 miles northwest of the entrance to Whitefish Bay. The ship departed Superior, WI on November 9th with over 26,000 tons of taconite ore headed for Detroit, MI. 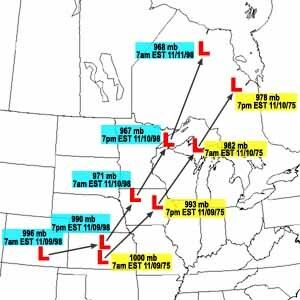 The storm took shape in Kansas on November 9th as an area of low pressure with a minimum central pressure of 29.53". The storm's minimum pressure dropped to 29.00" by the morning of the 10th as it moved into Michigan's Upper Peninsula with 30 to 45 knot winds (across the lake) out of the east, northeast, or southeast. The vessel remained relatively sheltered from these initial winds because its track hugged the northern shore of Lake Superior. But as the low deepened to 28.88" and crossed into Ontario that evening, the winds suddenly shifted to the northwest. This wind shift was accompanied by a sudden increase in wave height along the northeast shore of the lake, which proved to be disastrous for the Fitzgerald and its 29 crew members, all of whom perished. The year after the shipwreck, a song written about the tragedy by Gordon Lightfoot topped the pop charts. Light to moderate snow continues to fall in Wisconsin this morning with a quick inch or more possible north of Madison. The snow that has been falling has actually been enough to reduce visibility to about a half a mile in some spots. Very cold air a few thousand feet above has made the atmosphere fairly unstable and as an upper level disturbance moves out of Wisconsin this afternoon there will probably be a few heavier bursts of snowfall later today. Accumulations shouldn't be much, however, with some of those heavier bursts there may be a couple tenths of an inch that fall. Volcano Producing a New Island? A volcanic eruption under shallow water in the Canary Islands may mark the birthing pangs of a new island. The outpouring of lava onto the seafloor has been happening about 5 km (3 mi) off southern El Hierro island, at a depth of at least 50 to 100 meters (approximately 150 to 300 feet), according to various reports. Speculation on the part of volcanologists has been that, were it to last long enough, the eruption will eventually reach the sea surface, even beginning the building of a new island. If such an event were to happen, the eruption would undergo significant changes in character, including potentially violent eruptions. This possibility was likely behind a government decision to evacuate the town of La Restinga, which was reported on Nov. 5 by Canarias7.es. When the depth of water above an undersea volcanic erupt becomes shallow enough, violent steam eruptions often take place. This phase of undersea eruption is known as the "Surtseyan" phase, after the Icelandic island of Surtsey, which rose from the Atlantic Ocean in such a way during 1967. Still more growth of such an island would eventually culminate in lava emerging above the tide, potentially arming the newborn island against the battering of wind and wave. Molten rock has been emerging on the seafloor off the island of El Hierro since at least the first half of October. 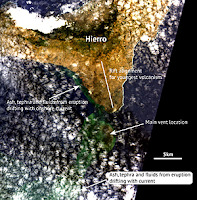 Evidence for the otherwise hidden eruption has included churning and discoloration of the sea, as well as fresh, hot volcanic rocks floating above the eruption site. After peaking in late October, the eruption of lava waned, only to begin with renewed vigor after the start of November. Swarms of mostly small earthquakes, which began before the eruption, have been ongoing. El Hierro and the Canaries as a whole are of volcanic origin; some volcanoes on the Canaries, including El Hierro, have erupted in historic times. 1:10pm Update: The snow is beginning to lighten up across the Rockford area but still coming down in a heavy burst near Beloit and up through Janesville. Snow will continue to fall across northwest Illinois for the next couple hours as it moves to the north. Look for the heavier snow to begin to taper some by mid-afternoon. 12:35pm Update: Moderate snow continues to fall with it sticking to grassy surfaces and vehicles. 11:50am Update: Snow will continue to fall across the area for the next couple hours with little accumulation expected. Wouldn't be suprised if we see some on the grassy surfaces. 11:15am Update: Rain mixed with sleet and now has is falling at the WTVO studio. Snow being reported in Dixon, Mt. Morris as well as Freeport, Savanna and Moline. Send any updates to: weather@wtvo.com. Please be careful on the roads this afternoon. Winter Weather Advisories continue for Green county in Wisconsin as well as for Jo Daviess county in northwest Illinois. The low has now moved east of the area and winds have been shifting around to the northwest just as expected. Light snow is being reported from Moline to Savanna as temperatures have fallen into the low 30s. This transition to either a rain/snow mix or sleet/snow mix is already underway in southwest Wisconsin where there have been reports of vehicle runoffs on Highway 151 between Beaver Dam and Columbus. The image is a snap shot of our Interactive Radar and nicely shows the snow moving into our western counties late this morning. Temperatures will continue to fall back for the remainder of the day and as this moisture wraps around the low a period of rain/snow or sleet may be experienced before temperatures cool enough at the surface and above to support snowfall across the area. Tony, one of our weather watchers in Freeport, has already reported snow falling with a blowing rain. Please use extra caution today even though road temperatures are above freezing there may still be some slick spots. We'll continue to update you throughout the day as this system moves through. Snowtober Caused by Global Warming?